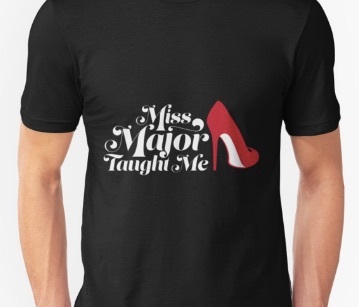 You can now order ‘Miss Major Taught Me’ t-shirts (and other ‘Miss Major Taught Me’ gear) from our store at Redbubble.com, with all profits from each sale supporting the House. We’ll be adding more designs to the store in the coming months. Extra-special thanks to the MAJOR! film and the image’s designer, Querido Galdo! Previous Previous post: We need your help to make the House of GG Retreat Center (a.k.a. “Oasis”) a reality!